Lighter and Transhipment operations require particular attention. Proper preparation, along with reliable scheduling and availability of on-carrying tonnage is absolutely crucial. Sea-Concert provides, with a contracted lighter fleet of total about 200,000 mtons DWAT that ensures availability of tonnage, Lightening and transhipment services in Thai waters. This is including landings on the Chao Phraya river beyond Bangkok, neighbouring rivers and the Eastern Seaboard. 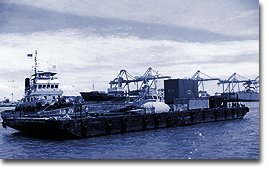 Reliable transhipment is available for basically all dry cargo commodities including Heavy Lift and Project cargoes. Sea-Concert is furthermore able to offer reliable transhipment possibilities via Thailand to destinations in most Asian countries and to destinations in Australia and New Zealand.